I love vendakkai sambar amma makes, it took me several days to get the similar taste.Vendakkai sambar is so flavourful that it tastes good on its own, amma always insist that the each veggie that we add to sambar gives a unique flavour to the sambar. 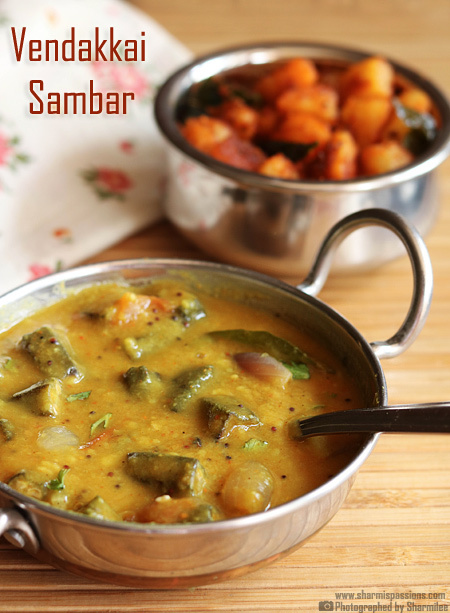 I have already posted other sambar recipes with carrot,murungakkai,pumpkin etc now this is another variation to the usual sambar we make.This sambar is perfect for even beginners to try out.We had it with hot rice and potato curry, yum combo! 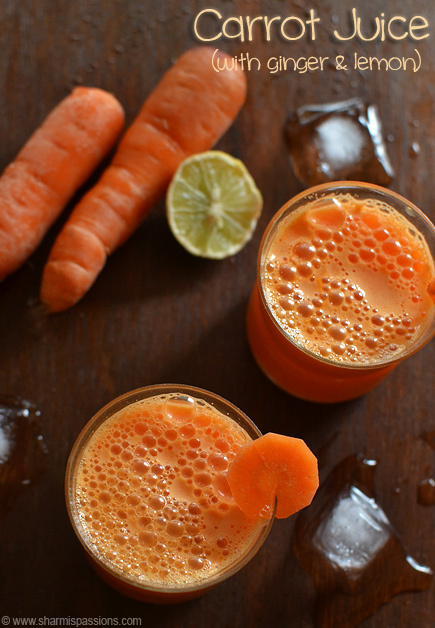 Rinse ladies finger well, wipe off the moisture with a kitchen towel or tissue.Trim both the ends of the veggie. Chop int 1 inch pieces.Now heat a non stick pan and saute ladies finger till the color changes slightly browned.By this time sliminess and stickiness would have reduced.Set aside. Pressure cook toor dal with enough water for atleast 5 whistles or until mushy.Once pressure releases mash it up well with a laddle,Set aside.Heat oil in a pressure cooker – add the items listed under ‘to temper’ let it splutter.Then add small onion, tomato and saute till raw smell of tomato leaves. Add ladies finger along with turmeric powder and sambar powder.Saute for 2mins.Add required salt. 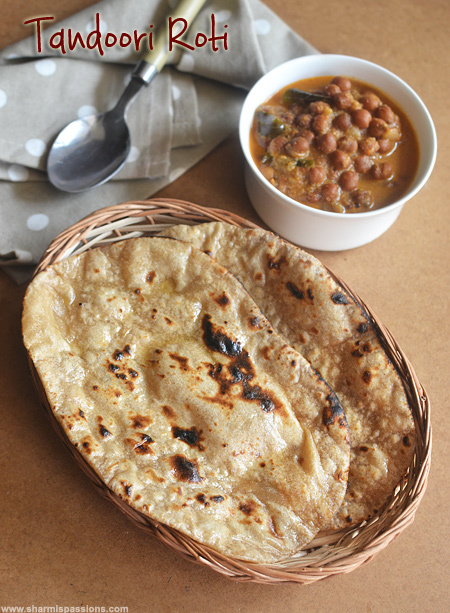 Then add cooked dal along with little water and let it boil in low medium flame until ladies finger is cooked. 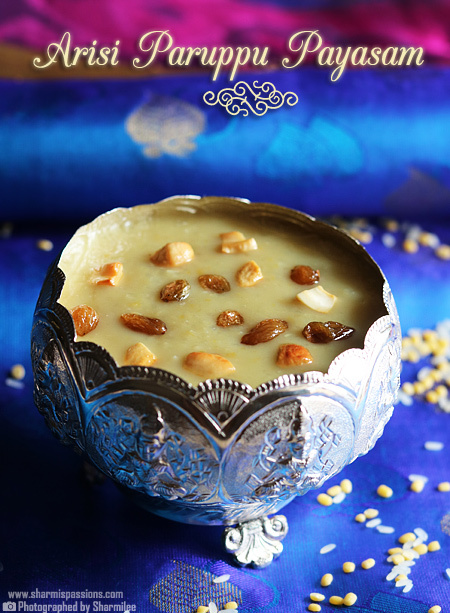 Now add tamarind water and let it boil for 5mins in low flame.Add chopped coriander leaves generously and switch off. 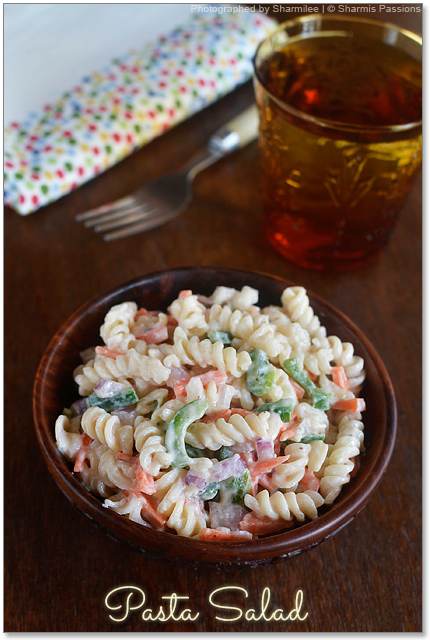 Serve with hot rice and any veggie of your choice. Sambar should be neither thick nor runny, it should be inbetween. Adding sambar powder and frying along with veggie gives a nice flavour. 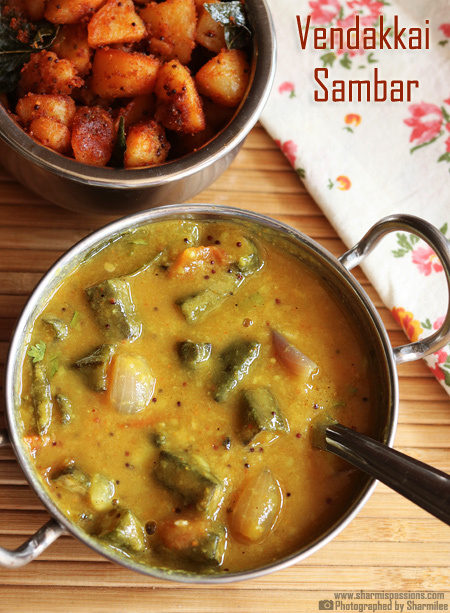 You can add any vegetable for this sambar. 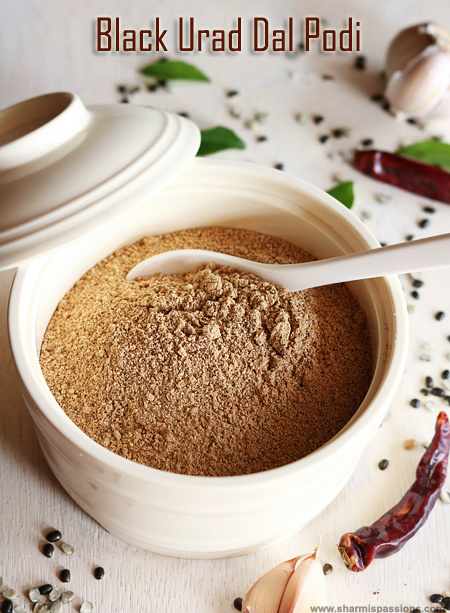 Add 1/2 tsp chilli powder if your sambar powder is less spicy. 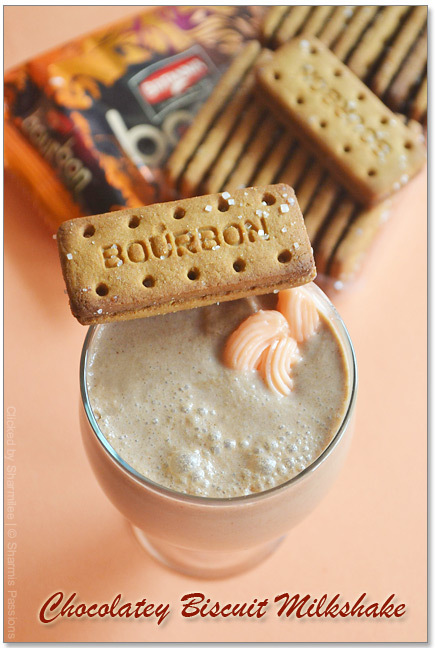 Thin tamarind water is just enough , no need to extract thick pulp. 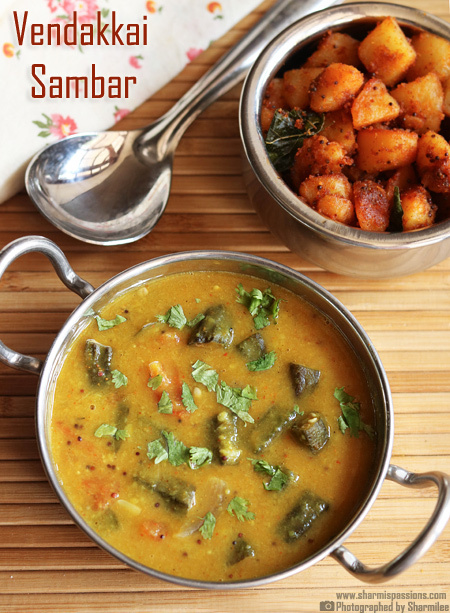 This sambar serves as a great sidedish for rice or even idli dosas. my favorite sambhar! drooling seeing these pics. 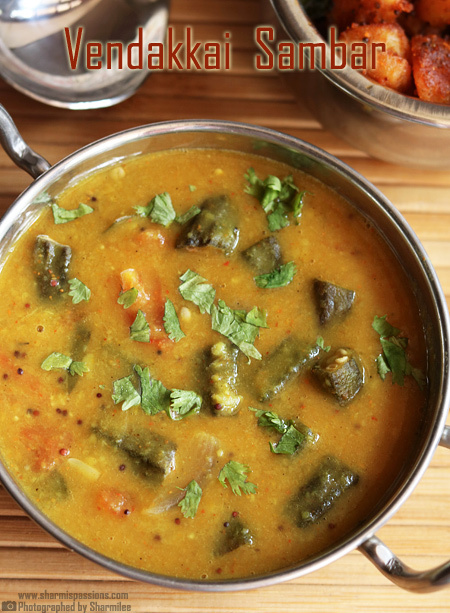 I loVe sambar and by adding my fav veggie that is taking this sambar to some other level.. I've always loved it when my Amma makes it once in a month on Fridays. Just a suggestion. Temper mustard seeds, broken urad dal, few curry leaves, Fenugreek seeds, compounded Asafoetida n one or two red chillies in a tsp of ghee and pour it over the prepared sambar. Then the coriander leaves. Mix well before serving. This way, the aroma of the sambar is even more lovely.